China Passions is designed specifically for the Chinese, those attracted to the Chinese, and for anyone with a love of China. 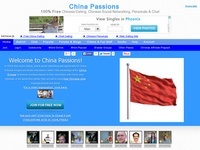 Aside from all the usual features specific to online dating and social networking sites, China Passions is 100% free and includes groups that are specific to China (ie. sports related groups, etc). It only takes a moment to click through to check it out and see what you think! 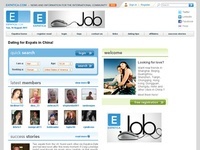 If you are looking for other expats in China, this is the dating site for you! Find love among other international singles who have chosen China as the place they want to live. Now, aside from the joy of living in Beijing, Shanghai, Guangzhou, Shenzhen, Tianjin, Chongqing, Hong Kong, Dongguan, Chengdu, Hefei or elsewhere in China...hopefully you can find love there too. Singles Meet Online - China Singles & More! Over 100,000 members from over 150 countries including China. Enjoy private chat with other members online. Entire site is available in French or English. "Free For Women". "Built on the success of Chinese Dating Net, the 1st online dating website for global Chinese since 1995, we provide a fun & safe environment for people to click and connect. Whether you are looking for a lifetime partner to watch sunsets together or a travel companion for that dream trip down the Silk Road, this is the place for you to find that special someone, from your hemisphere or the other half of the globe."